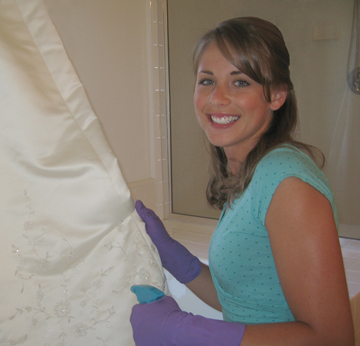 Why Clean Your Wedding Dress Yourself? Why in the world would you want to clean your wedding gown yourself? After all, doesn’t the tag say “Dry-clean only”? Isn’t that an awful big risk to take on such an expensive and cherished garment? You may consider cleaning your gown yourself to save money. Having a wedding gown cleaned can be quite expensive. And why? Most wedding gowns are made from washable fabrics. In fact, if your bridal gown fabric and lining are polyester, you should be easily be able to clean your own wedding dress by hand-washing it. Is it covered with sequins and beads, or is it mainly fabric? Will you be able to hand press it afterwards or will you need to find a dry-cleaner to press it? If your dress has a lot of tulle, hand pressing can be difficult. Tulle is usually nylon, which melts very easily. You can press tulle at very low temperatures with a pressing cloth, but you would need to be extra cautious. If your gown is polyester organza, consider spot cleaning only. Many polyester organza fabrics lose their crispness after any kind of cleaning. If you think it will need to be professionally pressed after cleaning, call around and get a price for the job. Some dry-cleaners charge nearly as much for steaming and pressing as they do for the whole job. If your goal is to save money by cleaning the dress yourself, make sure you will save money before doing it. If your dress is quite dirty, wet cleaning will get the dress the cleanest, whether you do it or whether a professional dry-cleaner does it. and receive a $10 bonus coupon good for Museum Method™ preservation kits.